Even as a small boy, Soma helped out at his families restaurant. He's become quite the cook, and anticipated he'd take over the business when the time came. Then came his father's announced he's going "on a trip", and the shop will be closed. Soma hasn't even graduated high school yet, and in the mean time is shipped off to a cooking academy. Figuring his skills will easily put him at the top, he announces at the opening ceremony that he'll be the #1 cook before he graduates. For an elite academy with a 10% graduation rate, that's quite a claim. 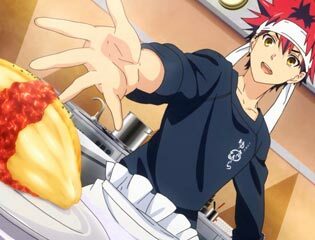 Food Wars is the most epic anime about cooking ever made. Or was it the post perverted anime about cooking ever made? Actually it's both. I'd be lying if I said most shounen anime interest me, but I couldn't get enough of Food Wars. Which is strange because it's highly typical for the genre, but it's the application to cooking that makes this anime work so well. 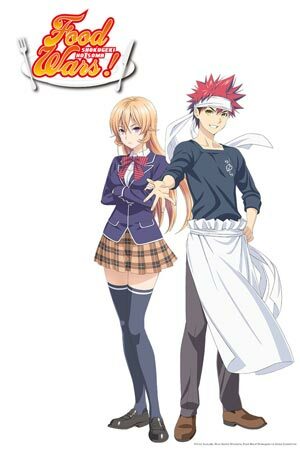 The basis of Food Wars is fairly simple: cooking is a super power, with battles centered around culinary skills. It has a nice balance in having fun with the idea but in a way that isn't too serious (we are talking cooking here). 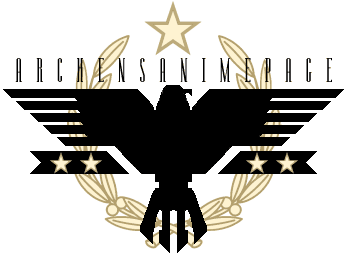 Part of what makes it so hilarious is the over the top approach in presentation, particularly with the soundtrack more suited to a war epic. The more bizarre aspect of this anime are the visualizations used to show reactions to food. These are wacky dream like sequences, the likes of which you might expect in far out TV commercials. In the case of females eating dishes, these often take a turn for the perverse and become highly... orgasmic. I'm not a fan of the way anime stuffs fan service in wherever it can, but in Food Wars it's just so damn hilarious the way this anime revels in it, making it even more funny. Thus far (26 episodes) it's good stuff, but it shows potential to go down the drain fast. Towards the end, too many new characters are dumped into the story (and this anime had a lot of characters to begin with). The preliminaries in a cooking tournament gets a bit long with battle after battle and not enough breathing room in between, which desensitizes the viewer to the otherwise fun concept. 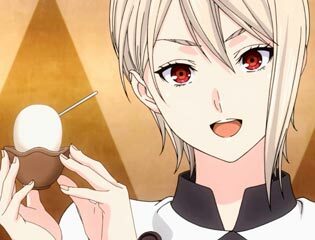 The formula for Food Wars is one I think could stay entertaining for a very long time, but may choke itself with filler if the animation studio starts pumping out seasons without enough content to fill them. Thus far it's all good and I really enjoyed Food Wars. Fun, wacky, and the way it keeps a strait face while serving up a healthy dose of silliness makes this one well worth the watch. School Slogan: All who oppose you shall be struck down through your cooking. 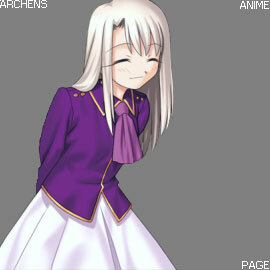 Nao: The essence of gourmet cooking can only be found in the pursuit of horror!